Designed in 1941, the Firefly was a desperate attempt to upgrade the standard of British Naval fighters. A total of 1,700 aircraft were built. Fireflies first saw action during the latter half of the Second World War, and after the cessation of hostilities, modest numbers were exported to a number of countries including Australia. From September of 1951 until January 1952 Royal Australian Navy Fireflies, flying from the aircraft carrier HMAS Sydney, flew strike missions against the North Korean army invading South Korea. These missions were extremely demanding and hazardous, yet no Fireflies were lost to enemy action. Fireflies were to remain in service with the RAN until 1966, being converted for anti-submarine duties and finally, target towing duties. 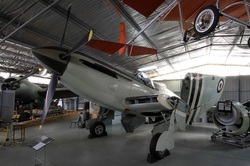 The Museum’s Firefly was built by Fairey Aviation in 1950 and served with No.817 Squadron aboard HMAS Sydney, although it did not see action during the Korean Campaign. It later served with No 723 Squadron before retirement in 1956, whereupon it was given to the Blacktown Squadron of the NSW Air League. The Museum acquired the aircraft in 1972.